This is a scalable context timeline. It contains events related to the event August 23, 2001: 9/11 Hijackers Alhazmi and Almihdhar Are Finally Added to Terrorist Watch List. You can narrow or broaden the context of this timeline by adjusting the zoom level. The lower the scale, the more relevant the items on average will be, while the higher the scale, the less relevant the items, on average, will be. 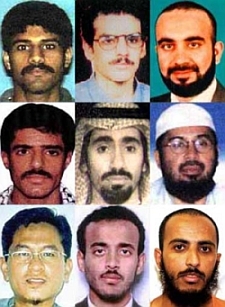 Acting on a tipoff by the CIA, Thai intelligence puts 9/11 hijackers Khalid Almihdhar and Nawaf Alhazmi on its watch list. In addition, it puts an alias al-Qaeda leader Khallad bin Attash is using (Salah Saeed Mohammed bin Yousaf) on the watch list (see January 20, 2000). The CIA is aware that the three men arrived in Bangkok on January 8 (see January 8, 2000), but seems to be unable to locate them in Thailand (see January 13, 2000). The Thai authorities will note their departure from Bangkok on January 15, but will not stop them and apparently will not inform the CIA of this for some time (see January 15, 2000 and March 5, 2000). [Bamford, 2004, pp. 230; 9/11 Commission, 1/26/2004, pp. 6 ] The CIA is apparently unaware of Alhazmi’s full name at this point (see January 8-9, 2000), but this does not prevent the watchlisting. The CIA will not add the three to the US watch list until late August 2001 (see August 23, 2001). TIPOFF is a US no-fly list of individuals who should be detained if they attempt to leave or enter the US. There are about 60,000 names on this list by 9/11 (see December 11, 1999). Apparently there had been no prohibition of travel inside the US, but on this day an FAA security directive puts six names on a newly created domestic no-fly list. All six are said to be associates of World Trade Center bomber Ramzi Yousef, including his uncle, Khalid Shaikh Mohammed (KSM). On August 28, 2001, six more names will be added to this list. Apparently all 12 names are associated with al-Qaeda or other Islamic extremist groups. 9/11 Commissioner Bob Kerrey will later note the discrepancy of the 60,000-name list with the 12-name list and comment, “seems to me, particularly with what was going on at the time, that some effort would have been made to make—to produce a larger list than [only 12 names].” [9/11 Commission, 1/27/2004] The FAA’s chief of security in 2001, Cathal Flynn, will later say that he was “unaware of the TIPOFF list” until after the September 11 attacks. 9/11 Commissioner Slade Gorton will say that this admission is “stunning, just unbeleivable,” and an “example of absolute incompetence” at the FAA. Other FAA officials will say they are aware of the larger list, but do not make much use of it. [Shenon, 2008, pp. 115] On the day of 9/11, two of the 9/11 hijackers will be on the 60,000-name TIPOFF list but not the 12-name domestic list, so airport security does not know to stop them from boarding the planes they hijack that day (see August 23, 2001).